OK – so I’ve stretched this a bit. My kids don’t always say “please” at the dinner table (though we’re working on it). They do, however, devour roasted broccoli like locusts coming off of a cleanse. When friends ask me for advice on how to get their kids/families to eat healthier, I suggest they get out a baking sheet and try roasting some vegetables. Roasting at a high temperature caramelizes the natural sugars in vegetables, making them sweet, crunchy and irresistible. True story: the first time I made roasted broccoli for a Walter family gathering, the eleven kids polished off 3 huge (HUGE) bunches of broccoli before the adults had a chance to go through the buffet line. 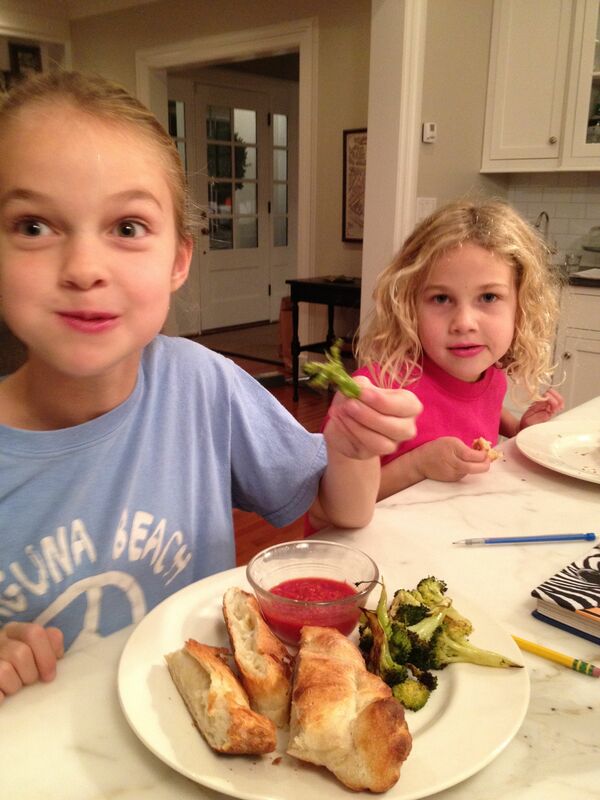 Another manners moment: Kids, please leave some broccoli for the rest of us! Chop the florets off one bunch of broccoli; reserve the stalks for soup, or peel and slice into pieces to roast along with the florets. Chop large florets into smaller pieces, since this makes for quicker cooking time and crispier edges. Dump florets onto an ungreased baking sheet. Drizzle lightly with olive oil. You want enough oil to coat the florets, but not so much that you turn your oven into a deep fryer. 1-2 Tablespoons should be plenty. 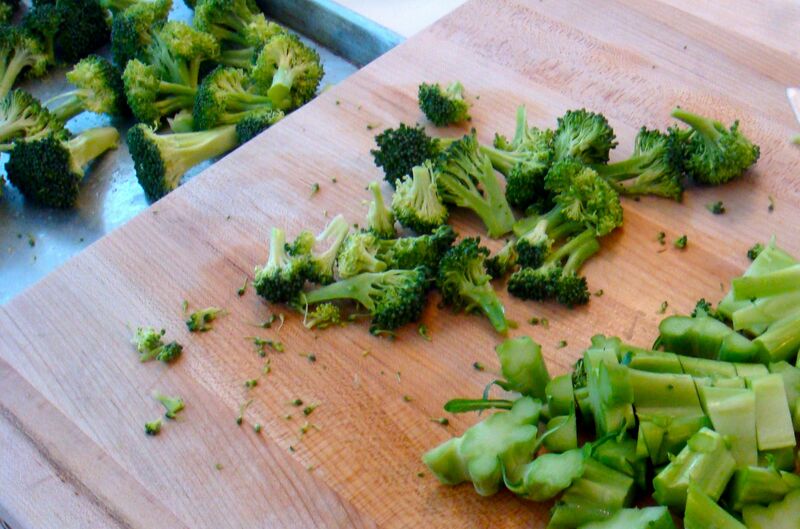 Using your hands, toss broccoli to coat, and spread out into one even layer. 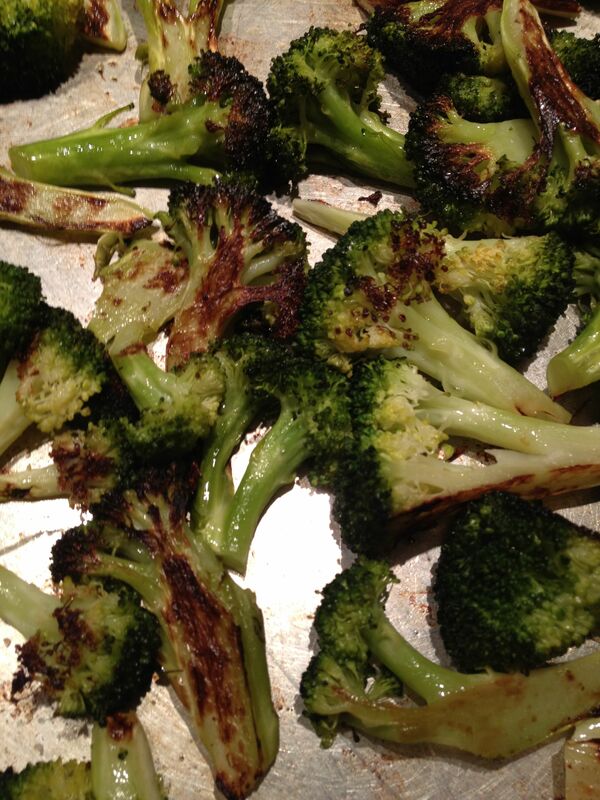 (If there’s not a little air space around each floret, use a second baking sheet to ensure crispy vs. steamed broccoli.) Sprinkle with a generous pinch (approx. ½ tsp) of kosher salt. Roast in a 450ºF oven for about 15 minutes, or until the edges have turned crisp and brown. Serve immediately for maximum crunchiness.